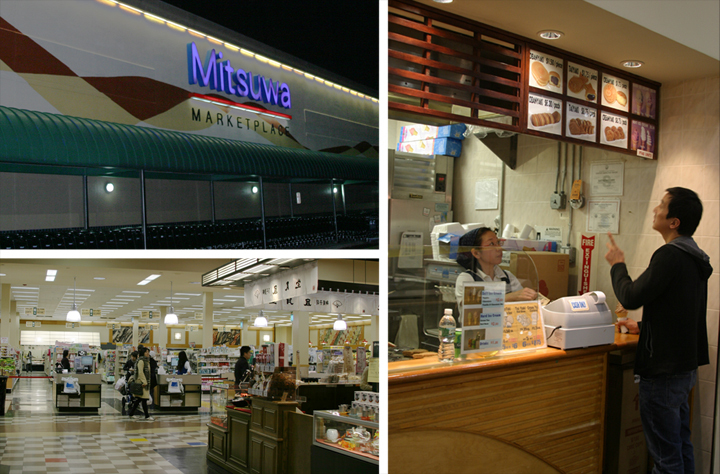 Mitsuwa, Nihon Kai, and the gorgeous view of New York across the Hudson River. We began our journey at Mitsuwa, the giant Japanese marketplace full of all things Japanese: restaurants mostly, a bakery, rows and rows of sake, beauty products, snacks... I really felt like I was back in Asia. 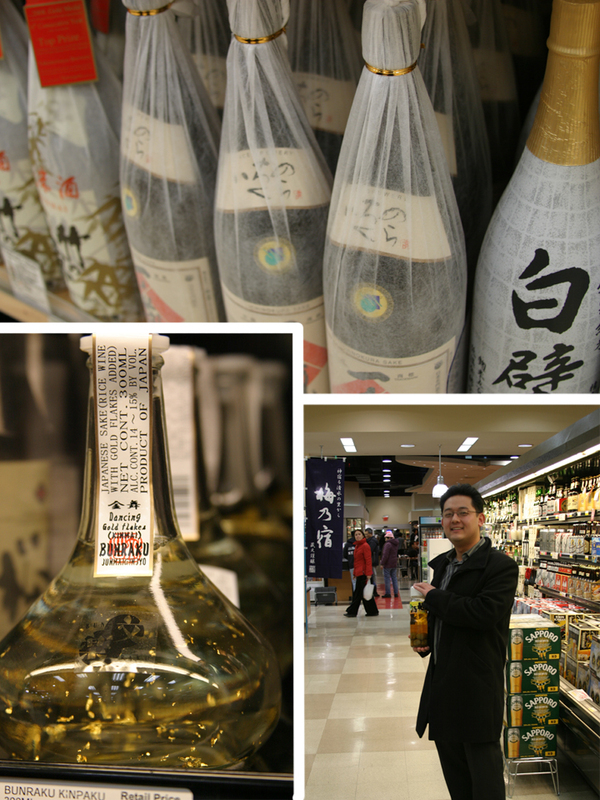 Alex is a huge sake fan, so we wandered over to that section. Nihon Kai, the restaurant we were headed to was BYOB. I must say, these Japanese really do know how to make everything so aesthetically pleasing. 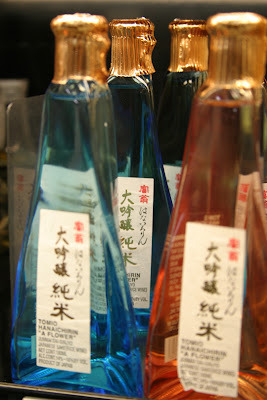 I always admire their packaging. I snuck a box of Pretz onto the checkout belt. I am truly addicted to the little cracker sticks and they're not something you would find in any ordinary American grocery store. Back in Hong Kong, I had a tendency to snack on them a lot during long days at work. mmm MSG comfort. I am debating whether or not to return to this Jersey spot to try out the curry and ramen shops. Voluntarily straying into Jersey again might just be worth it. Before I begin on any comments about our next destination, I must say that I wasn't feeling well at all that evening. I had a headache, I was tired, and at times slightly nauseated. I went out that night hoping I would feel better at some point. This factor may have tainted some of the Nihon Kai experience for me. Nihon Kai looks like any other Japanese sushi joint on the east coast. It's very unassuming with mostly bare walls. Straight to the point, eh? We walk in to be greeted by a completely empty restaurant. Hmm... this is good and bad. We'll have the full attention of the chef, but the general rule in most Asian countries is: longer the line or bigger the crowd, the more awesome you know the food must be. 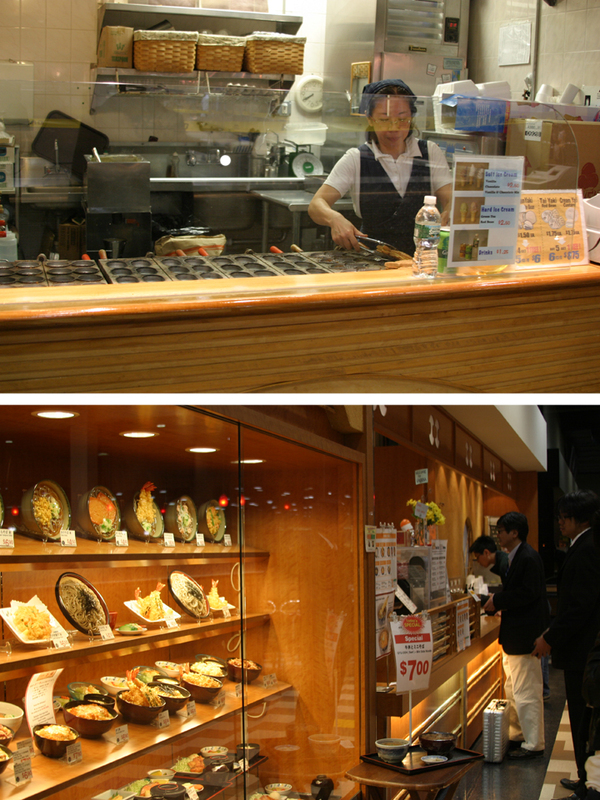 Empty restaurants or stalls are very suspicious. From behind the bar, Chef-owner Li Shing immediately calls out to happily greet Alex, asking where he has been and where his colleague is. He's only been to Nihon Kai a total of once nearly a year ago. I must applaud the Chef's good memory. We go straight to business. Alex tells him, "Omakase, $40!" Omakase (お任せ) literally means, "up to you." The customer is in the chef's hands. Typically, the chef will present a number of dishes of his choice, usually different pieces of sushi. If the customer is somehow still hungry (this rarely ever happens to me), you can request more and expect to pay only a bit more. We start off with eggplant. The gooey texture and combination of sweet and savory is surprisingly very tasty. It reminds me of a soft mochi. Warning though, it's very hot! Might want to let it cool and take small bites at first, lest you burn your mouth. It's followed by fried chicken, but I avoid eating too many pieces before the raw portion of the meal begins. I look towards the wasabi first, while we're waiting. It's usually my first indicator on the quality of the overall meal that is to come. It disappointingly isn't fresh here. Then again, we aren't paying the ridiculous omakase prices that I'm used to in Hong Kong or New York either. We are presented with a flurry of sushi pieces that I completely lose count of. He subtley watches us eat. He doesn't begin the preparation of the next fish until he sees we have started on our current. He times it well. One of my favorites is grilled toro. I was pretty eager for it to be served... and it was (I think he overheard me gushing about it to Alex). Here is a terrible photo of their less than quality grilled toro. It wasn't even freshly grilled and tasted like it was sitting in the fridge since yesterday. Quite disappointing. Alex makes a request and Chef Li tells us that he is fresh out of saba. At this point, I gather that the reason for the disappointing sushi in some cases is probably because of the fresh shipment coming in the next day or two. Ugh, we were feeding off the bottom on a Wednesday night. But Chef Li is proud and it is evident that he is trying his best to give us the best that he can with what he has. He tells me in broken English how he spent 21 years in the sushi business getting to where he is now. He started with the washing dishes at a Japanese restaurant and worked his way up to the rice and eventually to the fish, like a proper sushi chef apprentice. A native of Hokkien, China, he explains how the Japanese do not trust a non Japanese chef preparing their food. Yet, in his establishment, his Japanese patrons are shocked to find out he is Chinese and insist that he must be of Japanese origin due to his service and food. These three pieces tasted relatively alright, though again, it was evident the fish was not fresh by a long shot. The presentation was also surprisingly a bit sloppy. Realistically speaking, one can say the critic in me is just being nitpicky. The company and the service was fabulous. As we all know, good and sincere service goes a long way. I see why the place has its fair share of Japanese customers on a normal work day with fresh fish. I'd easily go back with Alex and friends to give Chef Li a second chance, if it wasn't all the way in Jersey!